and the author of The Big Roads Tangier Island, a 1.3 square mile spit of land in the Chesapeake Bay off the coast of Virginia, is a unique American small town. Most of its residents in this natural wonderland speak a distinct dialect passed down from their ancestors, English settlers who arrived in the seventeenth century. In this ""the soft-shell crab capital of the world,"" the economy has for decades revolved around blue crabs, and nearly everyone on Tangier--home to less than a thousand men, women, and children--is connected to the crabbing business. Going Under is a poignant, inside look at the past, present, and tenuous future of Tangier Island. Acclaimed journalist Earl Swift has spent much of the last two years living in this quaint and charmingly insular community that offers a few restaurants, two bed and breakfasts, and one ATM. 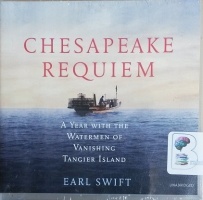 Interweaving the story of Tangier's remarkable past with the first-person stories of crabbers and others who make their living from the sea, it is a bittersweet and eye-opening look at a world that has, quite nearly, gone by--and a crisis that will eventually impact all Americans, regardless of their views on climate change.